Eternal Density wrote: What is it with GLR and this running joke which wasn't that funny to begin with? Are you hopping mad about this? We just want to know what Randall's rabbiting on about. I'm currently learning to play bagpipes and found the advice in this comic completely useless. 0/10, would not use xkcd for musical advice again. I Can't believe it's not Physics? Googling 'body made from dissolved bread' leads to lots of pages about the Catholic doctrine of transubstantiation, which I'm suspecting isn't quite the reference ... can anyone enlighten a mere Arts graduate? Been meaning to try Sublime Text for a while & was reminded by this. Back to 2010 for me! The Caps Lock key is great; abc uses uppercase and lowercase to distinguish octaves, and a sequence like G/F/^E/D/ is way quicker to transcribe with the Caps key. So back off, Caps Lock h8rzzz! If you wanted to write a simple online web form you had to lash it together from a blizzard of semi-documented frameworks and tools and utilities and runtimes, any single one of which could change and/or break at any moment. Tub wrote: Not pictured, at the far bottom end of the graph: "Code on my local drives"
"Example projects from CodeProject or ExpertSexchange"
Did the USA get an equivalent to the Raleigh Copper in the 1980s? Of course a sub-part of the joke is that GLR has managed to get us to write 19 posts in a thread on a comic that hasn't even appeared yet. 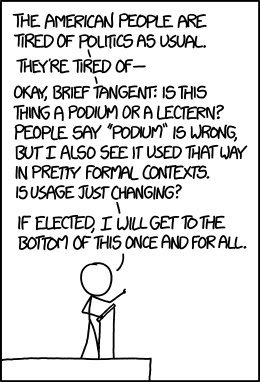 Title Text: BREAKING: Senator's bold pro-podium stand leads to primary challenge from prescriptivist base. That's a controversial platform to stand on. But accurate. "It's really am-ay-zzing ... "